A stray dog idly lies on the grass to escape Istanbul’s heat, while men and women stroll by, some with kids. This is a far cry from the Gezi Park of early June, when it was under occupation by anti-government protestors. Gone are the tents, the blankets, the banners and the pamphlets. Gone too are the gas canisters the police threw in to push the demonstrators out, in running battles in and around the park. If anything, it looks too good. The orange blooms in newly dug borders appear strangely fresh and orderly in what was, until recently, a poorly maintained, forgotten park. Five people died in clashes with the police. 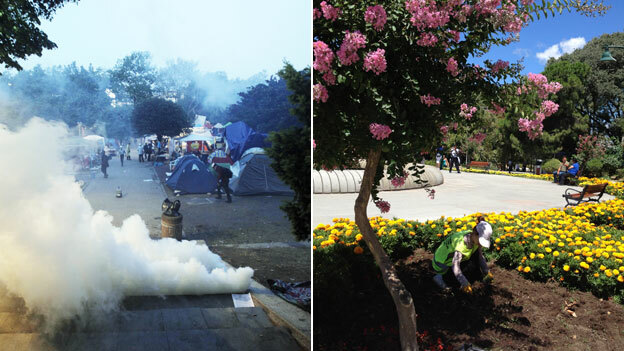 ”The park may look beautiful to some, but this is not my park anymore,” says Hazal. She is a 30-year-old PhD student at one of Istanbul’s top universities. She points towards where her tent stood, when she spent more than two weeks here, day and night, as part of the Feminist Collective. “There was no state, no government, no police. It was the most beautiful experience of my life,” she says. We are sitting on a wall at the entrance of the park, alongside two middle aged men who perched on either side of us as soon as I took out my recording equipment. But otherwise, life, it seems, is back to normal. The “tinerci” boys, unemployed teenagers of this area who are addicted to sniffing paint thinner, break out in a fight at a far corner, only to disperse a few minutes later. They are a common sight. Another staple of Gezi is also back. 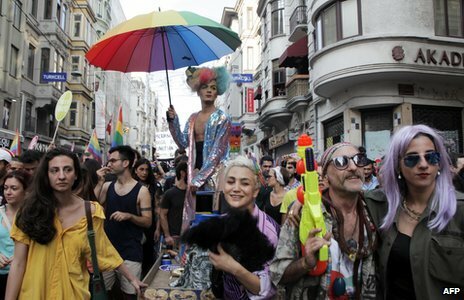 The gay joints of Istanbul are just a stone’s throw away, and I am not too surprised by the incessant gaze of a young man in a tight t-shirt passing me by, and looking back again. He is presumably out cruising. Or he could also be a member of the police – as Hazal says, there are many. But it is an open secret of Istanbul that Gezi Park is a major meeting point for gay men, during the day, and particularly after dark. ”As a gay man, this is where I socialised. This park helped me come out. Now, there is the internet, of course. But I still need this park,” says Volkan, who also took part in the Gezi protests. Volkan is a gay socialist. Two things that do not go down well with the current government of Prime Minister Recep Tayyip Erdogan. One of his cabinet ministers called homosexuality a disease. And Mr Erdogan’s AK party is boldly going ahead with its privatisation programme, selling publicly-owned assets to private business. Gezi Park was one such flagship project. Now it is up to the courts to decide whether it will remain a park, or be opened up for development, perhaps as a shopping mall, as the government initially suggested. 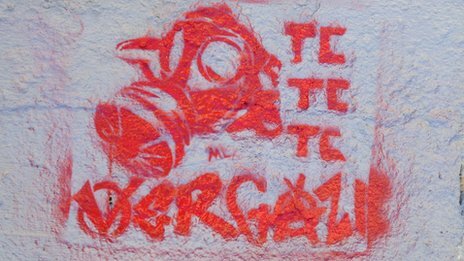 In Gezi, what first started out as a demonstration made up of a few city planners and environmentalists to save the trees, soon pulled in a diverse array of people disenchanted by the government’s Muslim conservatism, its free-market policies, or both. Gezi protestors seem to have shed many prejudices among themselves. United against a common enemy, unlikely alliances have emerged. I meet Ihsan Eliacik, the spiritual leader of the anti-capitalist Muslims, another prominent group in the Gezi protests, in the borough of Fatih, a stronghold of pious Muslims where the majority support the government. But Mr Eliacik and his followers, observant Muslims, voice some of the harshest criticism against Mr Erdogan and his government. In fact, the prime minister is suing the theologian for what he considers are insults on Twitter. This, in Mr Eliacik’s words, is the ”Gezi spirit” and in order to keep it alive, anti-capitalist Muslims organised street events throughout the month of Ramadan, the holy month of fasting, in the shape of communal public meals to break the fast at dusk, the iftar meal. Laying newspapers on the streets and in parks, the socialist Muslims invited everyone to eat together on the ground. It was a gesture of humility, they said, in defiance against the capitalist government. One such iftar was staged in Buyukada, the largest of the Princes’ Islands just off the shore of Istanbul, the bastion of the secular elite who have their summer retreats there. Certainly not your first port of call for a socialist uprising against the privileged, but the islanders hosted this event and invited the anti-capitalist Muslims. An unprecedented sight, for a country such as Turkey, where for years social attitudes and politics have been largely defined by the tug of war between the secular on the one hand and the religious sections of society on the other. Perhaps this ”Gezi spirit” could be a sign that old attitudes are reaching their sell-by date? Not so quickly, according to Roni Margulies, a poet, journalist, Marxist, atheist, and all-round campaigner, who was also in the park. He thinks it likely that given the diversity of the protestors, their differences of opinion will eventually come to the fore. Breaking the grip of the AKP government is by all counts a hard task. Mr Erdogan is still the country’s most popular politician, with three election victories under his belt. At the last round of votes, he received close to 50% of the electorate’s support. His critics may accuse him of being too business friendly, but Turkey’s GDP tripled under his rule. And the secular opposition in parliament is weak and fractured. Can the Gezi Park protestors unite in the future to become a credible political force and challenge Mr Erdogan’s authority? No-one is sure. But the movement has an important legacy for Mr Margulies. A victory, it may not be. But with public forums, marches and street events popping up all over Istanbul, the protestors believe they are finally making their voices heard, after a long lull. This entry was posted in Essays, News and tagged Anti-capitalist Muslims, Earth tables, Gezi Resistance, Iftar meals, Ihsan Eliacik, Istanbul gay community, LGBT on 25 August 2013 .